You are looking at a huge mistake: a new mainsail that did not fit, with too much roach. John Conser and I had miscommunicated. The new, super high tech and high cost main for Deerfoot II did not fit. The roach was way too big and stuck out almost three feet behind the backstay. There was no re-cut that would save the sail. It, he, and we were toast. But let’s at least give it a try before trashing it, we thought. We sailed faster of course, closer to the wind, and surprisingly, with less heel. As nice as all this was, dropping the main halyard each tack or jibe so that the roach would clear the backstay was not practical. So we decided to try a tack with the sail hoisted. And it cleared. We tried it again…same result! 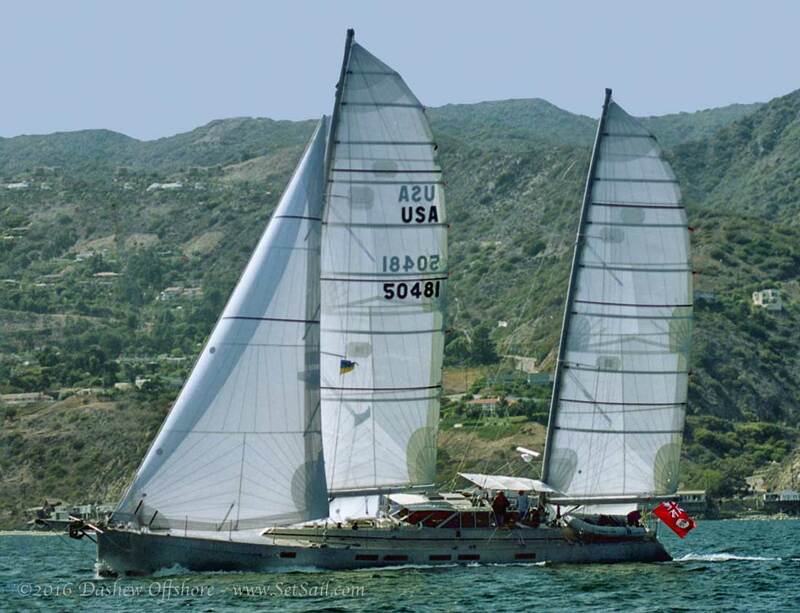 We quickly realized we had a breakthrough of sorts for fixed backstay cruising yachts. Compare the roachy main above with the conventional main below. The new main had way more area up high where the breeze is stronger. 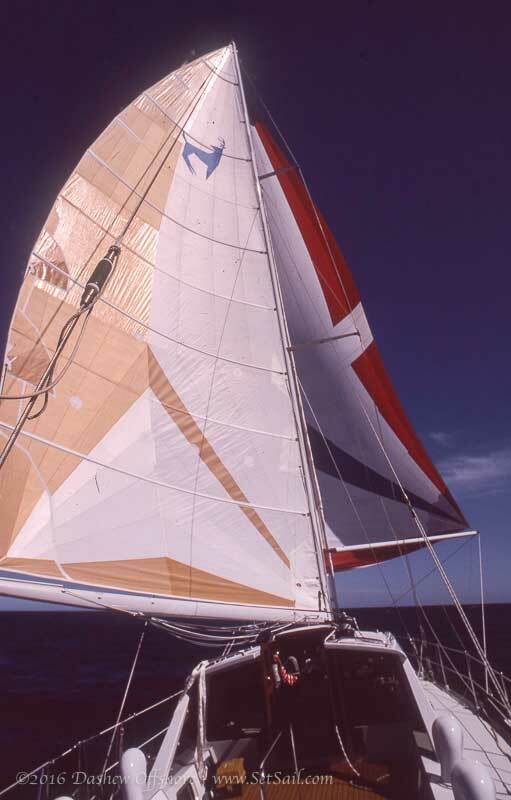 The more elliptical distribution of sail area increased effective aspect ratio reducing induced drag–hence less heel. We ordered new big roach sails for Sundeer with the same result. 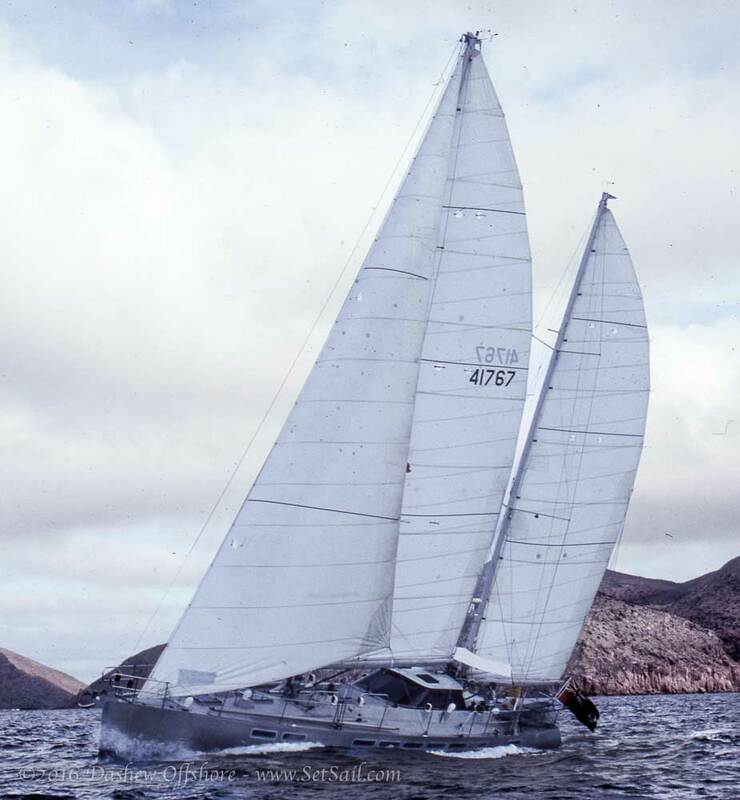 On our later designs like the Sundeer 64 ,60, 56, and Beowulf above, we went to swept spreaders and eliminated the backstays, allowing more roach, creating even more efficient sail plans. These resulted in powerful rigs, with a low center of effort, and very efficient drag angles. This allowed a small crew to harness the power, and the sail plan could be carried longer before reefing was required. Shallower draft was also a byproduct. 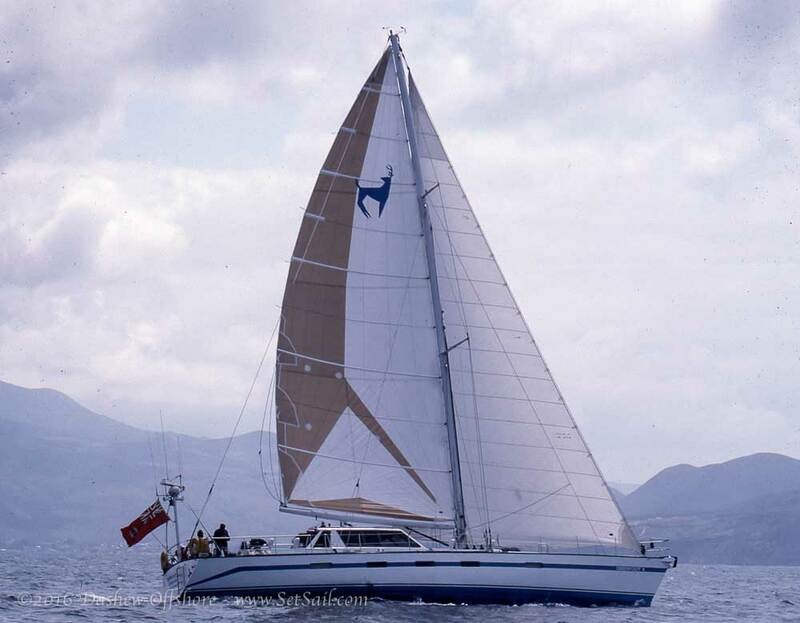 Our performance really took off with this second generation main and mizzen, which Dan Neri and Kenny Read designed and built for us at North. 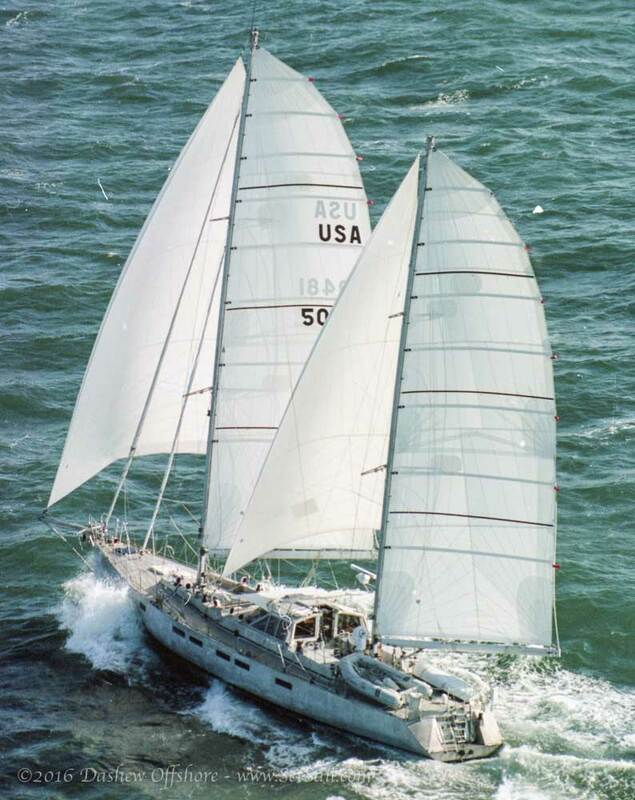 These came after the Volvo ocean race in 2001 where the mainsail girth restrictions had been eased. The high end competition taught North how to build big roach mains that were flat at the top and twisted off nicely with wind shear. 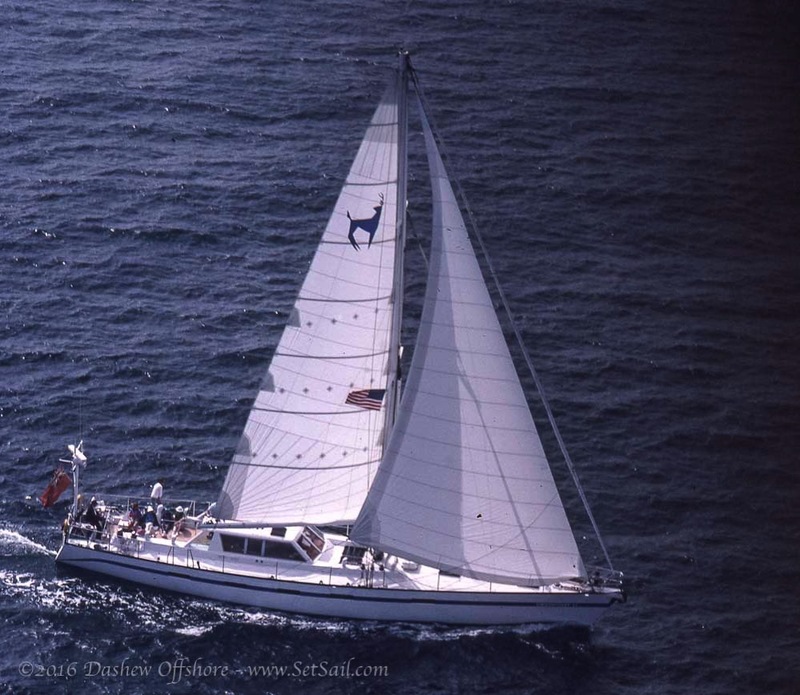 With these mains, and the two code zeroes, the two of us averaged 300+NM, anchor to anchor, on tradewind passages. And all because of the mistake with the new main for Deerfoot II. This entry was posted on Saturday, January 16th, 2016 at 12:48 am and is filed under Dashew Logs, Dashew Offshore, Dashew Offshore History, four, The Logs, Yacht Design. Both comments and pings are currently closed. A couple Beowulf questions – somewhat related to this post. I’ve been reading the Offshore Cruising Encyclopedia (gave myself the Blue Moon Deal for Christmas!) and it seems to say that Beowulf’s sistership is slightly different – little bit different keel is the one thing I remember. Is that right? Godspell, ex-Kondor, has a shallower keel, larger engine and the next size up Hundested prop, and weighs several tons more than Beowulf. She does not have the articulated bowsprit iether. The taller carbon rig would be a real help, although we might go a bit more agressive on the main and mizzen roach.